Research has shown that mindfulness meditation offers powerful health and wellbeing benefits. Qualified teachers can be in high demand, teaching one-to-one, as well as in groups and within organisations. This certified intensive, 5-day teacher training, leading to an accredited teacher training qualification is approved by The British Psychological Society and includes specialist tuition in mindfulness approaches, including the Mindfulness Now Programme which integrates key elements of Mindfulness Based Stress Reduction (MBSR) and Mindfulness Based Cognitive Therapy (MBCT). Both are evidence based and are recommended by NICE. The UK College of Mindfulness Meditation teacher training course is structured over 5 consecutive days, through a combination of practical ‘hands on’ learning along with the teaching of underpinning, evidence based fundamentals and benefits of mindfulness. Group sizes are limited to ensure so please book early. New dates below. In addition to the fundamentals of MBSR and MBCT our teacher training includes the unique Mindfulness Now programme, which offers an integrated / eclectic approach to mindfulness teaching and aims to equip teachers to work with individuals and groups with differing requirements, including helping with physical and emotional pain, stress and anxiety, as well as building emotional resilience. This programme is designed to incorporate one-to-one work with participants, along with group work, and is fully adaptable to meet the needs of individual participants. Mindfulness Now has also been designed in such a way as to make it possible for practitioners to integrate it with other therapeutic modalities. The Mindfulness Now teacher training programme is contained in an intensive 5 day course which is experiential in nature. Although online courses in mindfulness exist we believe that for a vocational qualification it is vital that teachers learn through a ‘hands on’ practical approach with plenty of discussion and to have the opportunity to teach the course within a safe, mutually supportive group, coupled with expert teaching and appropriate supervision. 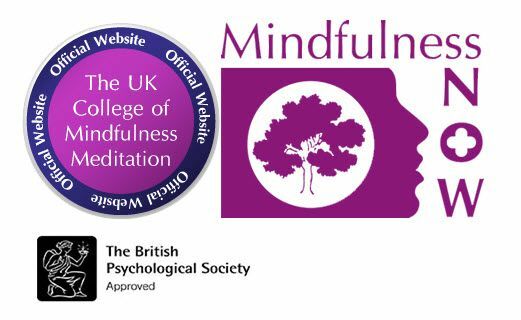 As part of of becoming an accredited mindfulness teacher students are required to undertake an assignment based upon a question paper and a practical case study which is written up for assessment. Students have up to six months from attending the course to complete and submit their assignment. Examples are given of assignment structure and guidance over the required content. In order to gain accredited teacher status students are required to make a declaration of compliance with our ethical code, including a commitment to engaging in clinical supervision (provided for the first 12 months as part of the training fees) and Continuing Professional Development (CPD). Teacher training includes the unique Mindfulness Now programme which offers an integrated approach to using mindfulness techniques to help clients deal with: stress, anxiety and serious physical and emotional trauma, as well as building emotional resilience. Meditation sessions are conducted daily as part of the teacher training and all participants engage in facilitated teaching practice. For more information on the UK College of Mindfulness Meditation, click here. Coming Soon, 2019 - 5-Day Intensive Mindfulness Teacher Training.